In the National Post today, April 9th, 2007, there is a story "59% in Canada can't name Vimy Ridge". "As Canada marks the 90th anniversary of the Battle of Vimy Ridge, a new survey suggests 59% of Canadians do not even know the name of the iconic First World War clash..."
You might think that the Canadian Government website would be designed to help to inform Canadians about Vimy Ridge, but you would be bitterly disappointed at the few crumbs you will find there. There are just 386 words in the VAC (Veterans Affairs Canada) Remembers The Battle of Vimy Ridge. That's the total effort that our Veterans Affairs department thinks the Battle of Vimy Ridge is worth. Not a single photograph. No map to show us just where Vimy Ridge is located. Just a miserly 386 words, without even a single link to more informative pages. With this miserable effort by the Veterans Affairs department, why is it newsworthy enough to spend newspaper space to tell us that "59% in Canada can't name Vimy Ridge"? Seems to me it's more newsworthy to report that 41% do recognize the name Vimy Ridge. Wikipedia does a much better job than Veterans Affairs, with articles on Canadian National Vimy Memorial and Battle of Vimy Ridge. The National Post article continued: "Overall, Canadians also have a poor knowledge of First World War heroes – with only 34% correctly identifying both Sir Arthur Currie, commander of the Canadian Corps, and Air Marshall William 'Billy' Bishop, a Canadian flying ace." The WWW is widely recognized as an important information source for many people, and for most people under thirty, so let's see what is available online, with special attention given to the Canadian Government website's contribution to informing people about Canada's "First World War heroes". If you google on Sir Arthur Currie, the first hit is on Wikipedia's Arthur Currie. This is a good general-purpose article, far superior to anything offered by the Government of Canada (that is, to anything findable by Google and thus findable by the public at large). Number four is the Canadian Encyclopedia Online's Sir Arthur William Currie. This is a brief document, just four short paragraphs, hardly the treatment one would expect for a "First World War hero". The Canadian Government comes in at number eight with Sir Arthur Currie as Canadian Leader. This is the only appearance of the Canadian Government's website in the top twenty as reported by Google today. Regrettably, this treatment does little to further the notion of Arthur Currie as a "First World War hero". The first words of the first sentence are: "There is a great deal wrong with Arthur Currie as an exemplary military leader..." Unfortunately, this is not an html document, but is pdf (so there are no links suggesting additional information resources). And it is a forbidding academic document, with a fat bibliography but not a single photograph, thus not very attractive for an everyday casual reader. After the Wikipedia article (above), I'd recommend number fourteen, CTV's Remembering Arthur Currie: Canadian war hero. IMO, this is much better than the Canadian Government's online information about Currie. CTV's article is outstanding (especially by comparison to the government's offering) in the links it provides to additional information about Currie and Vimy Ridge. Veterans Affairs should recommend that its website designers take a careful look at these excellent examples, by CTV and Wikipedia, of how to use links to advantage. The government's designers have so far not made good use of any of the three most important characteristics of the WWW – the linking ability, the search ability and the effectively unlimited space at nearly-zero cost (making feasible the extensive use of images, such as photographs and maps). If you google on Air Marshall William Billy Bishop, the number three hit reported is Wikipedia's Billy Bishop. A good effort, with lots of links to additional information. 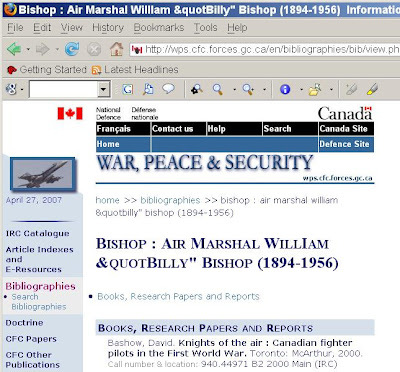 Number twelve is the Department of National Defence's War, Peace and Security page, Bishop: Air Marshal William Billy Bishop (with two glaring errors in the large-type headline, a spelling mistake in his name and an html coding mistake - see screenshot below). This is not a descriptive article. It is just a dry bibliography, a list of "Books, Research Papers and Reports", none of them available online. Next to useless, if you want online information to educate people about Canada's "First World War heroes". This is the only appearance of the government's website gc.ca in the top twenty, as reported by Google today. Mangled headline, war hero Billy Bishop webpage with errors by DND National Defence. For a full-size view, click on the image. After reviewing the online information provided by Veterans Affairs, and the Canadian Government in general, as revealed by Google searches (the best publicly-available way to find information on the WWW), I'm not at all surprised that many Canadians are uninformed about Canada's war history. Are you surprised? There's one clear conclusion: you'll do better with Wikipedia than with the Government of Canada, for this kind of information. Nice blog as for me. I'd like to read more concerning that matter. Thanx for posting this material.